Slam the door on soaring energy costs. The Lock-Top Damper makes a super tight seal with its silicone rubber gasket. This tight seal can reduce heat loss by 90% over even new traditional throat dampers. Traditional throat dampers have a metal-to-metal seal. They're leaky even when new and only get worse as they rust and warp with age. 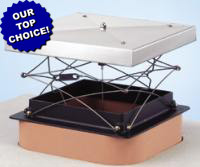 The Lock-top has a stainless steel lid attached to a cast-aluminum frame by an array of stainless spring wires. It is operated by a 30' cable dropped down the chimney with a handle mounted in the firebox. Just a tug on the handle will open or tightly close the Lock-top. It comes with a Chimney Fire Safety Device that locks the damper, open in case of a chimney fire. The optional Sweep's Ring cements to the flue tile. The damper bolts to it and can be easily removed for cleaning. The RS Adaptor lets you mate the Lock-top to round flue tiles. Comes with a 30' cable. A 50' cable and 4' cable shield maybe ordered separately. These dampers have a lifetime warranty. 6" X 9" to 9.5" X 12.5"
6" X 14" to 9" X 17.5"
14" X 14" by 17.5" X 17.5"
Energy Top Plus Damper, 13" x 18"